This Little Piggy Went to Market. This Little Piggy Pooped in the Bayou. Driving to work last week I spotted something odd on the side of the road. A short, stout hoofed brown leg was sticking out of the tall grass. I did a double take. 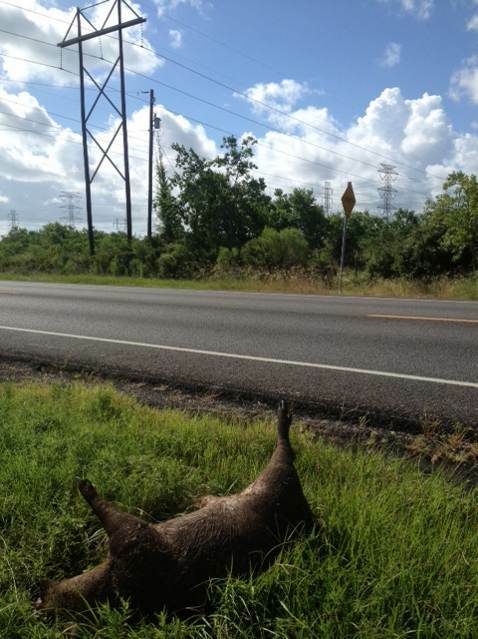 No, my eyes were not deceiving me; there was a dead hog on the side of the road. It was my first feral hog spotting in Galveston County. I’ve known they were around for a few years but had never seen one with my own eyes. I don’t live in a particularly rural area but there are not many homes or buildings on this stretch of road and there are still a few cattle grazing in the area. They have recently started developing a tract of land near the road and I’ve seen plenty of deer around so I’m not surprised that wild hogs have made a home there as well. Warning, photo of dead hog below the jump! Every watershed has many potential sources of water pollution. Septic systems and waste water leaks; dogs and cattle; fertilizer and pesticide runoff; the list goes on and on. Even wildlife can contribute bacteria to our water ways. Of course, there are many forms of wildlife that we want in our communities: song birds, wading birds, turtles, squirrels, frogs, owls, rabbits, hawks and more. There is however one unwelcome species that many landowners are actively trying to control – feral hogs. Feral hogs, sometimes called wild pigs, are extremely fruitful. Reaching sexual maturity at 6-8 months old they can have more than one litter each year of 6-8+ piglets. They are opportunistic omnivores feeding on plant material as well as animal matter and anything they can scavenge. Wild hogs seek out water to cool themselves and do not hesitate to poop where they eat, sleep or drink. Aside from having negative impacts on water quality, these nuisance creatures cause more than $52 million in property damage each year. Many large landowners have initiated trapping programs and many businesses throughout the state offer removal services. Feral hogs are not just a rural problem. As new areas are developed, the open land for hogs to range is decreasing and wild hogs are being seen more and more in neighborhoods where they root up landscapes and damage fences. Attend a workshop in Galveston County on September 28, 2013. More details can be found at http://www.dickinsonbayou.org.